CHILDREN. Teachers began learning how to teach about the Holocaust. The children began making and decorating paper butterflies. The school children chose the Butterfly symbol to symbolize the brief lives of the children who were killed in the Holocaust. The students received over 1 million decorated paper butterflies from around the world. The students received over 1 million decorated paper butterflies. "...I never saw another butterfly. The butterfly was the last one. Butterflies don't live in here...in the ghetto." From "THE BUTTERFLY" by Pavel Friedman, Terezin. 1942. FROM PAPER BUTTERFLIES TO THE BUTTERFLY FIELD ON HOLOCUAST REMEMBRANCE DAY...TO A PERMANENT WAY TO MEMORIALIZE THE CHILDREN WHO DIED IN THE HOLOCAUST. "The Holocaust Happened. I was there." Aaron, Arielle A. In the Presence of Butterflies: The Story of the Original Butterfly Project. 2011. 2nd edition January 2012 ISBN 978-1-4634-3285-0.
history’s terrible tendency to repeat itself without terrifying listeners about the future. 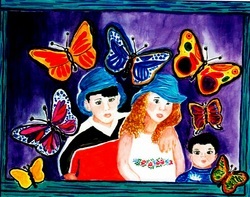 Arielle A. Aaron’s, (aka Joy Summerlin-Glunt), In the Presence of Butterflies speaks to those concerns by providing answers to those very questions and providing methods and suggestions for materials to do so. Butterflies documents the story of the original Butterfly Project planned and directed by South Carolina Social Studies teacher Eleanor Schiller. If you’ve had the pleasure of reading Ms.
Aaron’s previous work, I Remember Singing, you will remember Eleanor (Ellie) is the wife of Hugo Schiller whose Holocaust survival story was related in the book. Ellie and Hugo planned and directed a project in which over one million paper butterflies made by school children and collected by teachers all over the world were placed on a field in memory of the children who died in the Holocaust. The project not only gave people a visual picture of the magnitude of the lives lost, it also gave those involved the opportunity to teach and/or learn about the Holocaust and honor those who died. Chapter one is the why behind the Butterfly Project. Essentially it is the acknowledgement that what happened in Nazi Germany was due simply to pure, unadulterated evil allowed to grow to the point of disaster. Butterflies emphasizes that evil has been with us throughout history and will continue to be. As such, it waits for its chance to emerge and take over. Our best defense is to teach our students about it and prepare them to resist it on an individual level each and every day so it does not grow to the point it overcomes us or our societies as it nearly did in the last century. This is the mission of the Schillers, the Butterfly Project and Ms. Aaron’s book. woman who resisted Hitler’s evil by helping save as many children as she could, one of whom was Hugo Schiller. Chapters nineteen through twenty-two include information on museums and centers dedicated to researching, documenting and educating about the Holocaust, and commemorating the lives lost. Chapter nineteen discusses the U.S. Holocaust Memorial Museum in Washington D.C., and includes some of the Museum’s suggested guidelines for teaching about the Holocaust. The remaining chapters discuss the Yad Vashem world center for Holocaust documentation established in 1953; Simon Wiesenthal, Holocaust survivor and Nazi hunter; the Simon Wiesenthal Center founded in Los Angeles in 1977 and the Center’s Museum of Tolerance founded in 1993; as well as the Terezin Memorial established in 1947 in the Czech Republic to commemorate the victims of the Terezin Ghetto. The entire final chapter, twenty-three, is a highly useful extended Holocaust chronology. It includes events that occurred in Germany and Europe before Hitler’s rise, during his years of power and the post-war years after his fall up to June of 1948. Immediately following the book’s bibliography, are sections on how to teach about the Holocaust to ages K-Adult; best approaches and practices for teaching middle school and adult students; teaching the Holocaust across the curriculum; and discussion topics. There is also an extensive list of age appropriate reading suggestions that include fiction and non-fiction; a section on teacher resources; a list of books and films for adults; and a vocabulary list for students. prevent similar catastrophes from occurring in the future. SELA REVIEWER Paris Webb & Hugo Schiller, Holocaust Survivor with I REMEMBER SINGING at the United States Holocaust Memorial Museum in Washington, DC. rescued when he was 11 years old. "I wish this book in particular had existed when I was teaching middle school classes. When we read and discussed the Diary of Anne Frank and the events that led up to her story, many of the children, fortunate enough to have never seen the worst ugliness of this world, were unable to truly and fully comprehend how such a thing could have occurred. They understandably had great difficulty grasping how human beings could hate to this extent. They asked excellent questions like: "But why did the Nazis do this? ", "Why didn't someone stop them? ", "How come people let it get that bad? ","Why didn't they fight back?" Such questions I will never forget and tried my best to help them answer fully. Late in the discussion, one boy said, "Some people say that that never really happened." I am glad this book exists to add another survivor's voice, a child's voice to the evidence. At the time, the most personal evidence I could offer were a few pictures my father had saved from his service in World War II. He and his fellow soldiers were eye-witnesses to the horrors the Nazis inflicted on the people in those camps. They took pictures to document it. I had my students ask their parents’ permission to see the pictures before I showed them the next day to answer this young man's question. The next day I showed them only some of the pictures. Among the typical photos taken by GI’s of their buddies and the places they were in, these pictures suddenly appeared. They were taken when the soldiers were able to enter and rescue the surviving victims of Buchenwald…Thus ended the questions about the Holocaust as fact. I Remember Singing is the result of Aaron’s meticulous research into Schiller’s life. She recounts his experiences in detail and includes a chronology of the Holocaust, a glossary of terms, and a vocabulary list, making the book ideal for teachers and students alike. Hugo Schiller was 7 years old when Hitler’s Nazis dragged his father, the town mayor, from their home in Germany and took him to the concentration camp Dachau. Two weeks later, with no explanation, he was brought back home and forced to sell the family store. Hugo, who had grown up in a loving home, had never dreamed that there might be people in the world who hated him because he was Jewish. While home from school on vacation, Hitler’s Nazi troops returned, storming the Schiller home and giving them one hour to pack a suitcase and leave. The family was marched to a train and deported to Gurs, a refugee camp in the south of France, where they were held behind barbed wire in cruel living conditions with little or no food. Young Hugo would sing songs for hunks of coarse brown bread to feed his starving aunt and mother. Today, Hugo Schiller tells about the family he once had in Germany, and he tells the truth about what happened in the Holocaust. He warns that there are those bent on rewriting history to say the Holocaust did not happen. He warns that we must stay vigilant and make the world a better place, each of us in our own communities. I Remember Singing at the United States Holocaust Memorial Museum in Washington, D.C.
men, women and children do nothing. It is imperative that we understand who we are and why we are here.